Methods: A convenience sample of 27 (n=27) dental hygienists used a Columbia 13/14 curet with four different instrument handles to scale artificial calculus from typodont teeth. Each participant's muscle activity was measured using surface electromyography (sEMG). Results: Similar muscle activity was generated when scaling with instruments at 16, 18, and 21 grams with varying diameter handles. Instrument B generated significantly more muscle activity when compared to each of the other instrument handle designs (p=0.001, p=0.002, p=0.039). The lower left quadrant displayed significantly less muscle activity during scaling than the upper and lower right quadrants (p=0.026, p=0.000), although no significant interaction effect was found with instruments within quadrants. 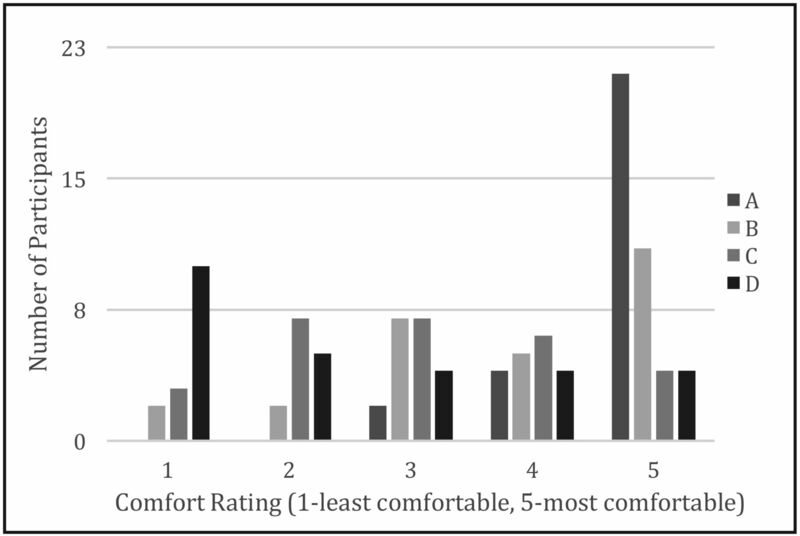 Most participants (62.96%) preferred instrument A, which was rated more comfortable based on weight when compared to the other instruments tested. Conclusions: Instrument handle design has an effect on forearm muscle activity when scaling in a simulated environment. The heaviest instrument with a relatively large diameter (B 11.1 mm and 23 g) generated significantly more overall mean muscle activity compared to the other three instruments. Similar amounts of muscle activity were produced by instruments weighing between 16 and 21 g. Participants' instrument preferences were more affected by handle diameter than weight. Results support the need for further research to determine the impact of these findings on muscle load related to risk of musculoskeletal disorders in a real-world setting. Designing instruments to address the ergonomics of periodontal instrumentation and to decrease cumulative trauma disorders in dental hygienists is an ongoing area of research and development. Contemporary periodontal instrument handles vary in diameter, shape, weight and material in an attempt to address ergonomic concerns. However minimal quantitative data are available to support the use of one design over another. While changing the diameter of the instrument handle has been promoted as a way to reduce stress on the practitioner, minimal research has actually been conducted in this area. Dong et. al used surface electromyography (sEMG) to evaluate the effects of changing the weight and diameter of periodontal handles on muscle load and pinch force in simulated dental scaling. Results suggested significant differences in muscle load depending on the instrument handle design.19,20 However, only one tooth was scaled and subjects used investigator designed instruments, not instruments currently available to practitioners. Clearly more research is needed to quantitatively address the ergonomic benefits of periodontal instrument handle design on the practice of dental hygiene. The purpose of this study was to compare the effects of four commercially available periodontal instrument handle designs on arm muscle activity during a simulated periodontal scaling experience that included working on multiple teeth and in all four quadrants of the mouth. Participants were recruited by advertisements on social media and given a $50.00 gift card incentive. Random assignment of participants to the various trials controlled for sequence effects, selection bias, investigator bias, and any unanticipated participant-relevant variable. Inclusion criteria included registered dental hygienists that were right-handed, had no previous musculoskeletal disorders, and no previous surgeries due to musculoskeletal disorders. The study used a counterbalanced 4 x 4 factorial design with participants acting as their own controls. Dental chair-mounted typodonts equipped with an artificial face were used to simulate a client's oral cavity during scaling. Using a template, permanent first molars (#3, 14, 19, 30 typodont teeth) in each quadrant were coated with one cc of artificial calculus on the mesiobuccal surfaces. Four different typodonts were set up for each participant with a different instrument handle randomly assigned for use on each of the typodonts. Table I shows the ranking of instruments from heaviest to lightest and their associated diameters for ease of interpreting the results. Written informed consent was obtained for each participant and standardized instructions were given. New Columbia 13/14 curets with one of four different commercially available handles were used by participants to hand scale the mesiobuccal surface of the first molars in each quadrant of the mouth for up to one minute per tooth. One-minute rest periods occurred between the scaling of each tooth in the assigned typodont and between each instrument. The counterbalanced design of instrument assignment should have also eliminated any systematic error that fatigue might cause. Considering the pace at which dental hygienists normally practice, the rest period was considered to be generous. Surface electromyography (sEMG) was used to measure muscle activity on four superficial muscles, Flexor digitorum superficialis, Flexor pollicis longus, Extensor digitorum communis, Extensor carpi radialis brevis, which give feedback independent of each other. Physical therapy consultants revealed that these four muscles were appropriate because they are responsible for gripping and manipulating manual instruments and sEMG muscle crosstalk susceptibility was minimal. Surface electromyographyis is a valid and reliable measure of real-time muscle activity and has been used in multiple studies evaluating musculoskeletal disorders.23-26 For all four muscles, wireless bilateral surface EMG sensors (Delsys, Boston, MA) were attached to each subject to measure muscle activity during scaling and were placed by physical therapy examiners. All sEMG data were sampled at 1,000 Hz and synchronized using a 64-channel Delsys Trigno data collection system (Delsys, Boston, MA). Prior to the study, a pilot study was conducted to test and refine the research methods. Pilot data was collected using two participants to test the sEMG equipment and software. At the conclusion of the study, participants completed an end user survey rating each instrument. Participants rated each instrument on a 5-point Likert scale, with 1 being not comfortable and 5 being very comfortable, in regards to weight and diameter. Additionally, participants were asked to choose which instrument they preferred the most and the least. EMG measures were analyzed using a two-way repeated measures multivariate analysis of variance (RMANOVA) with 4 different instruments and 4 different quadrants. If the results were significant, a Sidak post hoc test was used to evaluate one instrument handle in comparison to another instrument handle or one quadrant to another. A Friedman test was employed to analyze qualitative scaled survey responses. If the results were significant, a Wilcoxon signed rank test with Bonferroni correction was used to evaluate one instrument handle compared to another (p<0.0083). Statistical analysis for the EMG measures and qualitative survey responses were performed using SPSS 19 software and the significance level was set to p<0.05. Twenty-seven registered dental hygienists (26 females and 1 male) participated in this study. Thirteen participants (48%) were between ages 20 and 29, 10 (37%) were between ages 30 and 39, 2 (7.5%) were between ages 40 and 49, and 2 (7.5%) were 50 or older. Among the 27 participants, 15 (55.5%) had 1-5 years of clinical hygiene practice, 6 (22%) had 6-10 years of clinical hygiene practice, 4 (15%) had 11-15 years of clinical hygiene practice, and 2 (7.5%) had 21 or more years of clinical hygiene practice. The impact of instrument handle design on sEMG measures at three intervals: 10th percentile, 50th percentile and 90th percentile are shown in Table II. The 10th percentile is the static muscle load recorded during EMG recording, the 50th percentile is the median muscle load and the 90th percentile is the peak muscle load. A two-way RMANOVA revealed significant interaction effects at the 50th and 90th percentiles for instrument handles and muscle activity (F=6.243, df=3, p=0.000); therefore, the null hypothesis was rejected. Data analysis revealed no significant effects for instrument and muscles at the 10th percentile. Pairwise comparisons with Sidak post hoc test revealed Instrument B generated significantly more muscle activity when compared to instruments A and C (p=0.016) (p=0.041) at the 50th percentile affecting the flexor pollicis longus and extensor digitorum communis, respectively. Similarly, at the 90th percentile Instrument B generated significantly more muscle activity when evaluating the flexor pollicis longus (p=0.008) when paired with instrument A and the extensor digitorum longus (p=0.039, p=0.016) when paired with instruments A and C.
Combined muscle activity mean scores and standard deviations were determined for each instrument handle design (Table III, Figure 1). Two-way RMANOVA revealed statistically significant differences (F=6.243, df=3, p=0.000). Pairwise comparisons revealed only the heaviest instrument (B) generated significantly greater muscle load when compared to all other instruments (A; p=0.001, C; p=0.002, D; p=0.039). Results indicate no statistically significant differences in overall muscle activity when comparing instruments weighing 16 g, 18 g and 21 g. Significant differences in overall muscle activity were not generated until the instrument weighed 23 g.
In addition to comparing sEMG among handle types, overall mean scores for muscle activity were calculated for each of the four quadrants of the mouth: upper right (UR-1), upper left (UL-2), lower left (LL-3) and lower right (LR-4) (Table IV, Figure 2). The highest mean was found when participants were scaling the lower right quadrant (x=28.7) and the lowest mean was produced in the lower left quadrant (x=26.2). When comparing overall muscle activity for each quadrant, two-way RMANOVA results revealed statistically significant differences (F=6.802, df=3, p=0.000) in muscle activity generated. Data from pairwise comparisons using Sidak post hoc tests revealed that when scaling, regardless of the instrument used, the lower left quadrant generated significantly less muscle activity when compared to both right quadrants (UR-1 p=0.026, LR-4 p=0.000). However, there was no significant interaction of instrument and quadrant on average muscle activity (F (1,9) = 0.49, p=0.881). 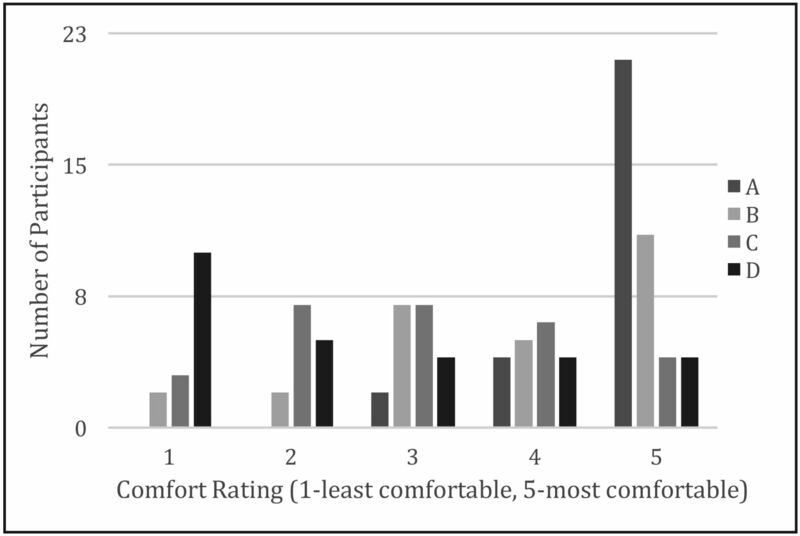 Subjective evaluations of the comfort of the various handle designs were collected to determine if muscle load generated was correlated with participants' preferences. Results reveal 62.96% of participants (n=17) preferred the instrument with the largest diameter and lightest weight: instrument A. 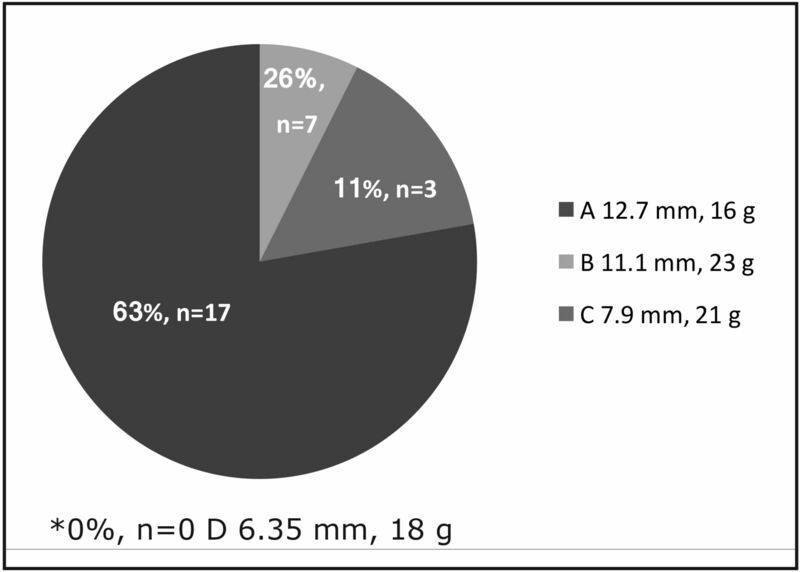 Approximately one fourth of the participants (25.9%, n=7) preferred the heaviest instrument with second largest diameter: instrument B (Figure 3). When participants were asked which of the four instruments they liked the least, 77.78% (n=21) of respondents chose the smallest diameter instrument (D). A Friedman test was used to determine significant differences related to participants' perceptions of the four instrument handles in relation to the weight and diameter. The test revealed statistically significant differences between instruments in participants' opinion of diameter (x2(3)=50.584, p=0.000) (Figure 4) and weight (x2(3)=24.650, p=0.000) (Figure 5). The pairwise comparisons with a Wilcoxon signed rank test determined that instrument A was rated significantly more favorably when compared to the other three instruments in the category of weight (B z=2.643, p=0.008; C z=3.708, p=0.000; D z=3.819, p=0.000). Instrument B was rated more positive based on comfort related to weight when compared to instrument D (z=2.840, p=0.005). Wilcoxon signed rank tests also revealed that instruments A, B and C were rated more comfortable in diameter than instrument D (A z=4.398, p=0.000; B z=4.023, p=0.000; C z=3.333, p=0.001). Additionally, participants rated instruments A and B more favorably for diameter than instrument C (A z=3.974, p=0.000; B z=3.521, p=0.000). Cumulative trauma disorders continue to be negative stressors affecting dental hygienists working in the clinical environment. Quantifying muscle workload during scaling through sEMG studies may assist dental hygienists in practicing more ergonomically and decreasing risk of musculoskeletal disorders. The present study compared the effects of four commercially available periodontal instrument handle designs on forearm muscle load during a simulated periodontal scaling experience. Results demonstrate that instrument handle designs had a significant effect on forearm muscle activity when performing periodontal scaling. The heaviest instrument with a relatively large diameter (B 11.1 mm and 23 g) generated significantly more overall mean muscle activity compared to the other three instruments. This finding was also supported when evaluating individual muscles as instrument B resulted in significantly more muscle load at the median and peak percentiles for both the extensor digitorum longus and the flexor pollicis longus muscles when compared to the other instruments. The most likely explanation for these findings is the higher weight of instrument B when compared to the other instruments. Results suggest that instruments weighing less than 23 g did not significantly vary in the amount of muscle activity produce because similar muscle activity was produced for instruments weighing 16 g, 18 g and 21 g. These findings may indicate there is minimal ergonomic benefit when changing the weight of an instrument in these ranges. Muscle load during scaling only increased significantly when the instrument weighed 23 g. Other studies revealed the lighter the weight and larger the diameter of an instrument, the less muscle activity generated and this was partially supported by this study.7, 20-22 Results from this study suggest muscle load was more affected by weight than instrument diameter. For example, while instrument A had the largest diameter (12.7 mm) and lightest weight (16 g), mean scores were almost the same for instrument A (x=27.5) when compared to instrument D with the smallest diameter (6.35 mm) and a relatively low weight (18 g)(x=27.4) as demonstrated in Table III. Dong et al. studied self-made instruments weighing 15 to 24 grams and found that instruments with the lightest weights (15 g) demonstrated the lowest muscle load.19, 20 However, results from this study did not find that the lowest weight instrument produced significantly less muscle activity. Differences between the two studies might be attributed to only one tooth (number 29) being scaled in the Dong study compared to four first molar teeth being scaled in each quadrant of the mouth in this study. Differences might also be due to differences in diameter sizes of the instrument handles in the two studies. Dong et al. also found a significant increase in muscle activity generated and pinch force with heavier instruments.19,20 This study did not evaluate pinch force, but found no significant increase in muscle activity among the test instruments until the instrument weighed 23 g.
This study used commercially available instruments so the findings on muscle load could apply to instruments currently used by practicing dental hygienists in real world practice. Results suggest clinicians might consider using instruments weighing less than 23 grams for ergonomic benefits, but they may not experience additional ergonomic benefits when using instruments in the 16-21 gram range. While this research supports that lighter weight instruments produce less muscle load, results suggest clinicians electing to scale with an instrument weighing 16 grams would likely experience the same benefits in terms of reduced muscle load as an instrument weighing 21 grams. However, diameter of the handle may also affect workload due to pinch force, but this variable was not evaluated in the present study. Further research may be indicated to examine the effects of pinch force generated during scaling using commercially available instruments. 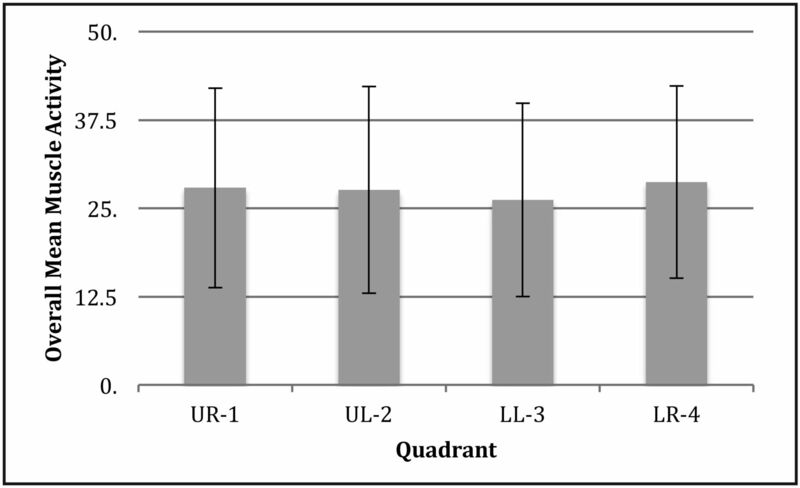 The present study also measured overall mean muscle activity produced for each quadrant of the mouth while scaling: upper right (UR-1), upper left (UL-2), lower left (LL-3) and lower right (LR-4). Regardless of which instrument was used, the lower left quadrant had significantly less overall muscle activity than both quadrants on the right side. These results might be explained by the position of the fingers, wrists and forearm when scaling the right side of the mouth. The position for the scaling the right quadrants of the mouth may require more movement and positions that deviate from an ergonomic neutral wrist and forearm positions. Dental hygienists may be able to modify their work pattern by first scaling on the right side of the mouth since more muscle activity was generated when scaling these areas regardless of which instrument was used. This might minimize the probability of muscle fatigue that could lead to poor scaling outcomes. Because the lower left quadrant produced the least amount of muscle activity, a practical ergonomic suggestion may be to scale this area last or when the hygienist is feeling fatigued. Results from the end user survey indicate the majority of participants preferred the instrument with the largest diameter and lightest weight (A 12.7 mm, 16 g) reinforcing ergonomic suggestions for ideal instrument handle size. Interestingly, results found that one fourth of the participants still preferred the heaviest instrument (B 11.1 mm, 23 g) despite an increase in muscle load, suggesting that diameter has more effect on preference than weight. The diameter size of the instrument could have provided a more comfortable grip for participants when scaling, therefore making diameter more influential than weight. The instrument handle that had the smallest diameter and was the second lightest instrument (D 6.35 mm, 18 g) was least preferred by the participants; this also supported diameter was more of a preference indicator than weight. 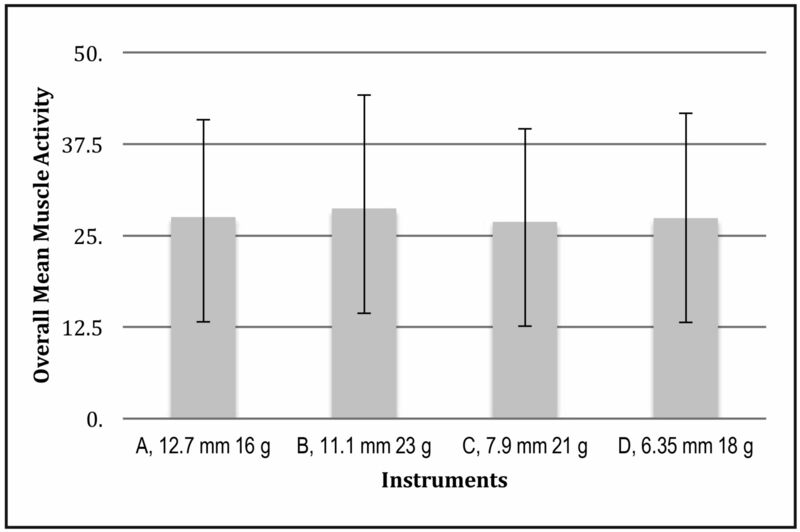 The smallest diameter instrument might have been more difficult to comfortably grasp, even though it only weighed 18 g.
When asked to rate instruments on weight and diameter alone, the majority of participants found the largest diameter and lightest weight instrument (A) was more comfortable and did not prefer either of the smaller diameter instruments (C and D). Again, this can most likely be attributed to the larger diameter and lighter weight being easier to grasp and producing less muscle activity when scaling. These results reinforce that dental hygienists might improve ergonomics of instrumentation by using lightweight instruments with larger diameter handles. According to the current study, clinicians preferred instruments with larger diameters and relatively lighter weight handles when scaling. Additionally, instruments weighing less than 23 g may be utilized to decrease forearm muscle activity while scaling, therefore possibly reducing the clinician's risk for MSDs. While dental hygienists use a variety of instruments to provide therapy, there has been limited research on sound ergonomic theory to support use of specific instrument handle designs. This research expands evidenced-based knowledge concerning which commercially available instrument handles may be least traumatic to the hand, wrist and forearm muscles during scaling all quadrants of the mouth. While powered instruments have been recommended to reduce cumulative trauma disorders, there are many instances where dental hygienists must use hand instruments for optimal client care and calculus removal. Results from this study may benefit dental hygiene educators, future clinicians and current practitioners since it provides quantitative information revealing the comparative effects of commercially available hand instruments of different weights and diameters. Results may also assist practitioners and educators in making more educated decisions regarding selection of scaling instruments for ergonomic benefit. Several limitations may have influenced findings of this research. The minimal time participants used each instrument might not have been long enough to reflect their true preferences. The instrument handles had various textures, which could influence grasp and possible muscle workload. The study used a simulated periodontal scaling experience of a shorter duration than a dental hygienist scales in a typical day; muscle activity could vary over a longer workday. Therefore, future studies in a real world setting on instrument handle designs of similar textures are suggested. Safe muscle workload levels are undetermined and need to be investigated. Future studies are also needed to determine whether the reductions in muscle activity found in this study are enough to make a clinical difference. Finally, future research may also want to evaluate pinch force generated by various commercially available instrument handles in order to determine its impact on ergonomic practices. Results from this study suggest a similar amount of muscle activity was generated during scaling with instrument handles at 16 g and 12.7 mm diameter, 18 g and 6.35 mm diameter or 21 g and 7.9 mm diameter. Once the handle weight increased to 23 grams with a diameter of 11.1 mm, a significant increase in muscle activity occurred. Therefore, using instruments weighing less than 23 grams may reduce the muscle activity required for periodontal scaling with manual instruments. Regardless of which instrument was used less muscle activity was required to remove artificial calculus in the lower left quadrant. Subjective analysis indicated participants' instrument preferences were more affected by diameter than weight. The findings in this study emphasize the need for further research to more fully conceptualize the impact of instrument design on forearm muscle activity related to risk of cumulative trauma disorders. The authors would like to thank the American Dental Hygienists' Association's Institute for Oral Health for grant funding for this research project. This manuscript supports the NDHRA area of Professional development: Occupational Health (Methods to reduce occupational stressors).
. Prevalence and correlates of musculoskeletal disorders among Australian dental hygiene students. Int J Dent Hygiene. 2009 Aug 1;7:176-181.
. Predictors of work-related musculoskeletal disorders among dental hygienists. Int J Dent Hygiene. 2012 Nov 1;10:265-269.
. Cumulative trauma disorders among dentists. J Musculoskelet Pain. 2014 Jun 1;22(2):193-198.
. Musculoskeletal disorders of the neck and shoulder in dental hygienists and dental hygiene students. J Dent Hyg. 2007 Jan 1;81(1):1-16.
. Work-related musculoskeletal disorders among Brazilian dental students. J Dent Educ. 2009 May 1;73(5):624-630.
. An evidence-based review of ergonomic features of dental hygiene instruments. Work. 2010 Jan 1;35(4):477-485.
. An international review of musculoskeletal disorders in the dental hygiene profession. Int Dent J. 2010 Oct 1;60(5):343-352.
. Musculoskeletal disorders of the neck and shoulder in the dental professions. Work. 2010 Jan 1;35:419-429.
. Work-related musculoskeletal disorders among dentists-a questionnaire survey. Ann Agric Environ Med. 2011 Jan 1;18:79-84.
, special report [Internet] 2004 Jun 23 [cited 2014 Jan 13] Available from: http://www.bls.gov/bls/bureau-of-labor-statistics-information-guide.pdf.
. Relationship of musculoskeletal disorder pain to patterns of clinical care in California dental hygienists. J Dent Hyg. 2015 Oct 1;89(5): 305-312.
. Ergonomics in dentistry, part 1. Dent Today. 2002 Apr 1;21(4):98-103.
. Prevalence and risk factors of hand problems and carpal tunnel syndrome among dental hygienists. J Dent Hyg. 2001 Spring;75:130-133.
. Musculoskeletal disorders self-reported by dentists in Queensland, Australia. Aust Dent J. 2006 Dec 1;51:(4):324-327.
. Musculoskeletal disorders and symptom severity among Australian dental hygienists. BMC Res Notes, 2013 Jul 4;6(1):1-5.
. The effect of tool handle shape on hand muscle load and pinch force in a simulated dental scaling task. Appl Ergon. 2006 Sep 30;38(5):525-531.
. The effects of periodontal instrument handle design on hand muscle load and pinch force. J Am Dent Assoc. 2006 Aug 31;137:1123-1130.
. Keyboard reaction force and finger flexor electromyograms during computer keyboard work. Hum Factors 1996 Dec 1;38(4):654-64.
. Comparison of surface to indwelling extrinsic finger muscle EMG during use of computer pointing devices. Proceedings of the Human Factors and Ergonomics Society Annual Meeting. SAGE Publications, 1998 Oct 1; 42(6).
. Diagnosis of carpal tunnel syndrome: electrodiagnostic and MR imaging evaluation. Neuroimage. 2004 Feb 29;14:93-102.
. Normalisation of EMG amplitude: an evaluation and comparison of old and new methods. Med Eng Phys 1999 May 31;21:247-257.
. Reliability of electromyographic normalization methods for evaluationg the HIP musculature. J Electromyogr Kinesiol. 2007 Feb 28;17(1):102-111.
. Reliability of normalization methods for EMG analysis of neck muscles. Work. 2006 Jan 1; 26:123-130.